You can’t spend too much time outside before you realize that there’s a lot of death and dying sprinkled throughout nature’s celebration of life. That’s part of the deal, though, right? Living and dying? Growth and decay? To a point. Unfortunately, a lot of the dying we see these days is not all that natural after all. Here in the Great Lakes, we have phragmites, oriental bittersweet, and mute swans. These species all come from somewhere else and are able to out compete native species because they’re playing by a difference set of rules. While they thrive, local flora and fauna suffer. Last week we had the opportunity to see the evidence of one of these invaders up close. An ash tree just over on our neighbors yard gave in to a gentle breeze and crashed, spreading its disintegrating trunk and limbs across the entire street, leaving a hefty debris pile twenty feet across. Thankfully no one was driving by at the time. After the neighbors all came out and we hauled the thing to the side of the road, I was able to show the kids what caused the tree to die in the first place. 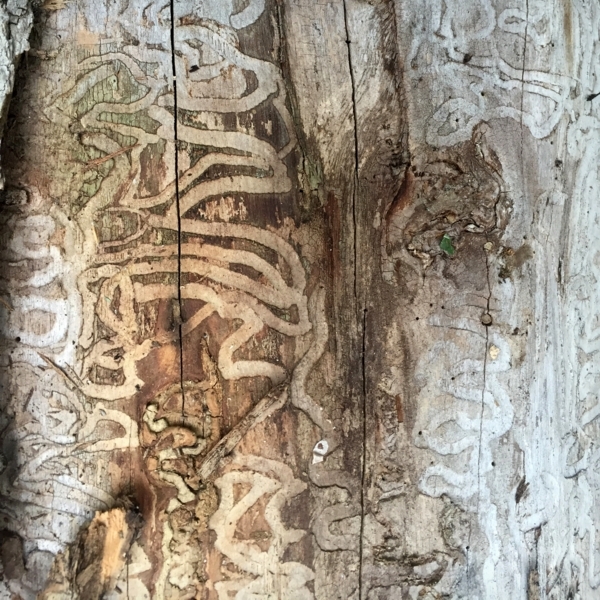 It was the emerald ash borer. This bug inserts its eggs under the tree’s bark and when the larvae hatch, they eat the cambium. You can see the tracks of their consumption when the bark eventually falls off. Now that all the ash trees in the state are dead, I am not sure how the borer will survive, and what value there is in restrictions on the transportation of firewood. This event, in any case, was a nice illustration of how fragile the ecological web really is.